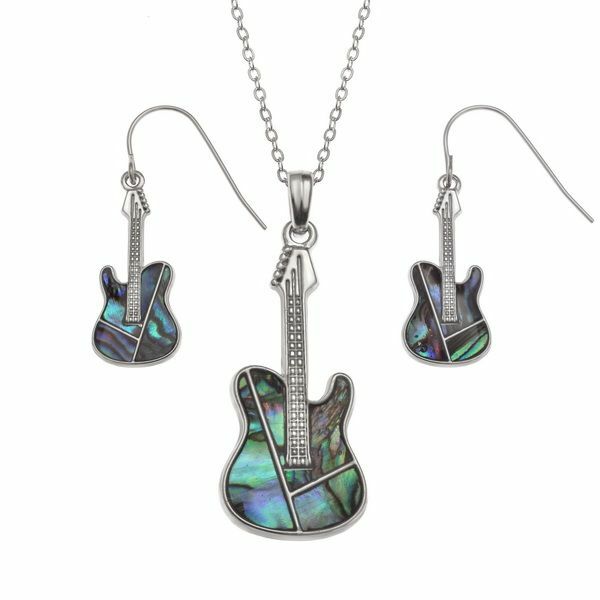 Guitar necklace & matching earrings made from Paua shell by Tide Jewellery with imitation rhodium finish, a lovely music gift for any guitar player or guitar student. This is a beautiful musical gift and a similar treble clef necklace is available. Comes complete with box for safekeeping. This Paua shell is sustainable sourced. Size: Approx. Chain is 46cm (18") and guitar is 43 x 20mm. Earrings 28 x 11mm. All Tide products are nickel, cadmium & lead compliant.